Camping is great. Ironically, some campers end up amassing piles of gear such as tents and backpacks and stuff to take along to enhance their stay (or make it more comfortable). If you camp with kids, that brings hauling stuff to a whole other level. We camp, but do so in a rented motorhome. It’s a compromise. It gives us space to haul our things and stay dry. It’s a small cabin on wheels. The nice thing about having to buy a gift for a camper, even us who go just once a year in a motorhome, is there’s really no shortage of gadgets and gear you can buy. It’s astonishing how much stuff there is for camping. As a camper, I’m kinda enamored with it. Sometimes the simplest things are the best. For example, before our most recent camping trip, we bought a large solid water jug with spout (looks like a keg). 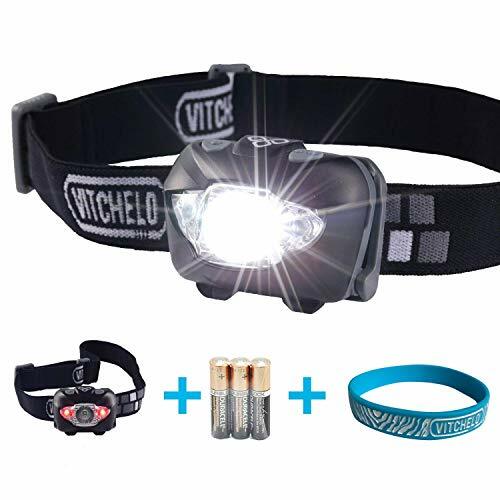 While you would never use this on a hiking trip, it’s perfect in campgrounds. If you’re faced with buying a gift for friends or family members that camp, check out our list of ideas below organized by price. It’s the practical gifts that often make for the best and most treasured. Sometimes, people don’t want to buy themselves little things and items that could help them in some way, simply because they want to allocate their resources elsewhere. You can step up and be that person who gives them that item and device and be all the more cherished for it. One of those items is the Trash Ease. These clips attach to a picnic table with absolute ease, allowing a garbage bin to rest comfortably on the clips. Trash can be quickly deposited within the trash before the wind decides to pick up and toss everything in the nearby river. In fact, the wind can be a mighty foe of the camper. A garbage bag can easily be blown away if not secured to something. These clips make it so your camping friends don’t have to worry about polluting the environment and can instead dispose of their trash with ease. I actually received a headlamp as a gift and loved it. I still love it (so do my kids). For the money, these are super useful when camping. 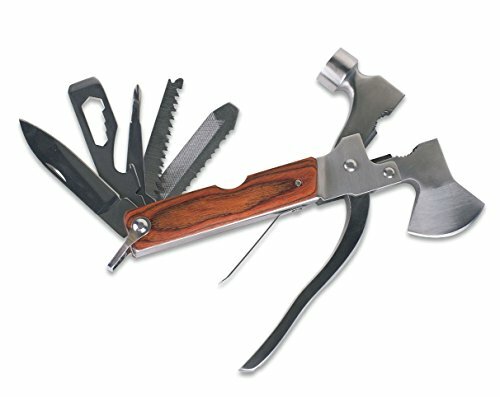 You hope you never need a tool, but when you do, having the right one is awesome. However, when camping, you don’t want to haul along a tool box. That’s where a multi-tool can come in handy. Check out this beauty. Tired of spilling your wine sitting around the campfire? Here’s a pretty clever solution. Every camping adventure has a story. This story can either be full of laughs or misery. Usually, it’s a bit of both. However, these tales should be recorded, so they’re never forgotten. You can give a camper a travel journal, so they can record every detail about their latest adventure. It’s a fun way for them to look back years later and recall those silly times spent camping with friends or family. Gift ideas for campers should always be thoughtful, and this journal not only shows that you’re thinking about them but also allows them to record their thoughts, too. Comfort is everything on those long rides to your destination. Sometimes your camper or tent, too, needs a little added level of comfort to properly relax after a day of hiking or just enjoying the outdoors. That’s where the Regal Comfort bamboo pillow comes into play. This powerful pillow contains memory foam, so it can offer the user lasting support for their neck and back when they rest or go to sleep. Whether they’re sitting in the car or trying to nap in the tent, the pillow can offer their body the relaxing and comfortable position they need to rejuvenate themselves and get back on the trail with their family. This gift is perfect for adults who know all too well that camping doesn’t always necessarily mean comfort. You can offer them that missing comfort with this pillow. Security can sometimes be a question when you’re camping with strangers. While there seems to be a pretty safe environment at most camping sites, there’s always that chance that someone may be on the lookout for an opportunity. To help your friends when they go camping, you can give them a Yeti Security Cable Lock and Bracket. This device can easily wrap around most items in order to lock them down tight. Potential criminals will have a difficult time breaking into those storage devices with this beast attached. To show your friends you care, and to help them keep their items safe, you can offer them this powerful tool in security. No one likes to dirty their hands by lifting logs and placing them in the fire. Sometimes, too, you have to turn just that one log that’s slightly out of place in order to receive the best fire possible. A stick can’t always be the answer. To help your camping friends or family members out, you can offer them a Firebuggz as a gift. This log lugger is specifically designed to carry logs and place them in the fire. They can also be used to pick logs up inside of the fire and move them if required. There’s also the additional services you can use them for like pulling out weeds at your camping site and moving branches that are obscuring your view. Essentially, much and more can be done with this log lugger, and by giving it to your friends, you can make their camping experience just that much easier. Storage is everything when it comes to camping. At least in the sense that storage is difficult to find, and so you need to make the most of what you got. One solution you can offer to campers is an air lounger. This comfortable piece of furniture can be used instead of actual furniture which can free up a lot of space in the truck or RV. They’re also incredibly easy to inflate for anyone who is a bit too lazy to do the old pump and pipe trick. The lounger simply needs to be swung around in the air to collect it. That’s it. It’s inflated and ready to be used. You can rest it on the grass and kick up your feet and relax. When it comes time to pull up the stakes on your tent, you can easily deflate the lounger and fold it into a small corner somewhere. 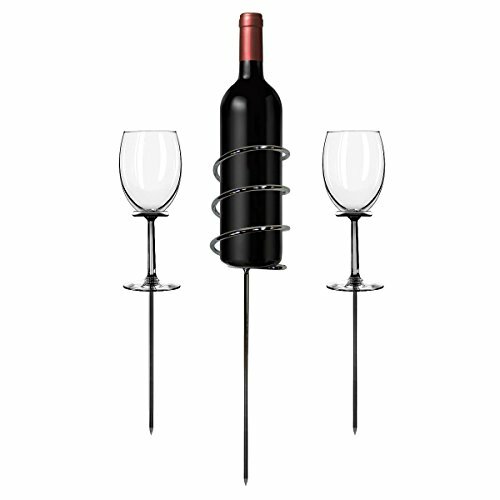 This gift is perfect for those who need or want furniture but just don’t have the space for it during transport. For those who like to go out fishing when camping or need easy storage when they’re out for a hike, it can be difficult to carry the items you want. That’s where the all-terrain folding wagon comes into play. We have one of these and it’s brilliant. We didn’t receive it as a gift, but it’s invaluable for hauling stuff around, whether a day at the beach or camping. Of course now our kids insist on being pulled in it too. 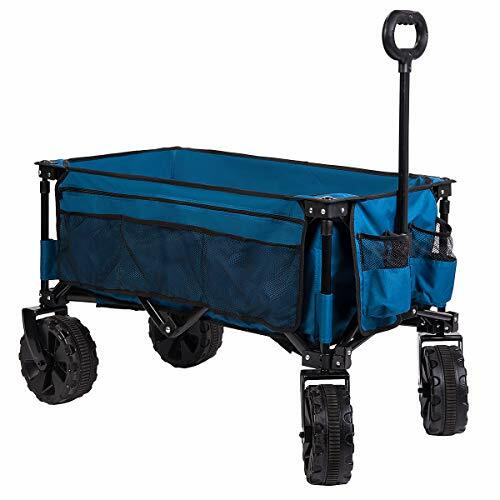 The rubber wheels of the wagon allow it to be pulled through practically any type of terrain. It’s also sizable enough to carry fishing poles, tennis rackets, or any other supplies that you might want to take along with you. There are also flaps that can be used as pockets to carry tools, smaller items, and even your phone. One of the best aspects of the wagon is that it can be easily folded back up and stored with ease. This is perfect for those who don’t have a lot of space to bring hiking backpacks with them. Chairs are a must for any camper. While some may enjoy sitting on a log beside a campfire for the rustic value, you can be sure that, in time, their back is going to be aching, and they’re going to wish they had brought along a chair. You can help them fill this desire with an Anti-Gravity chair. 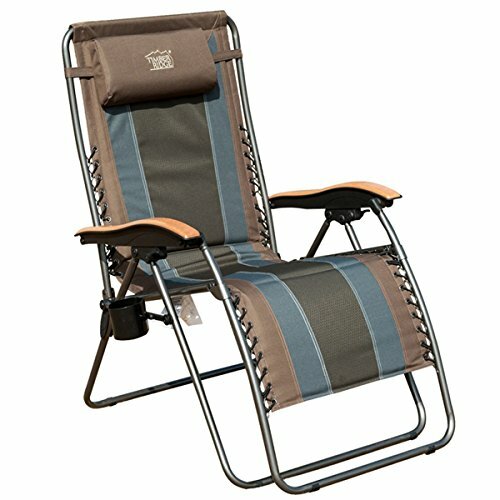 It’s extremely comfortable, built for the outdoors, and one of its best features is that it can actually recline. Your friends or family members can sit back–literally–and warm their toes beside the fire while they engage in storytelling and jokes with their camping buddies. This gift is sure to delight them and provide a great deal of comfort. No camping trip can be performed without somewhere to prepare and cook food. While RVs may have those devices inside, traditional campers who prefer tents often have to rely on the grills that campsites provide or the campfire itself. This can severely limit the quality of cooking they can perform. You can help them cook the best meal possible with a Slim-Fold Cooking Station. As its name suggests, the cooking station can be easily folded during transport, so it doesn’t take up a lot of space. When it’s unfolded, however, you have a large countertop, a lower rack for storage, and four tables that can be folded out and used for additional storage. In addition, it also has cup holders and hooks for your garbage bag. To make sure your friends and family eat well, you can provide this cooking station as a gift that will thrill them. When you’re out in the woods, it’s important to keep your food and beverages cool. On hot days, it can be easy to become dehydrated and without a cool drink to consume, your body is going to be sitting out some of the family activities while you recuperate. To help campers have the best gear possible to keep their food and drinks cool, you should give them the high-quality Yeti Hard Cooler. This massive storage cooler is thick which means it keeps the temperature colder for longer. It also has an added feature of not misting on the outside, so you don’t have to worry about it leaking on the floor or furniture. For those who need a safe and effective place to store their drinks and food, this gift is perfect. Sometimes the toilets in an RV or trailer just can’t cut it. They’re either too low or tiny and can just make you feel uncomfortable in using them. You can help your friends take that toilet out and instead offer them a solution that they’re sure to enjoy. The Thetford Bravura toilet comes in both a high-version model and a low-version model, so you can be sure that you’re getting the right fit for your intended recipients. It’s foot-pedaled operation for ease and sanitary conditions, so you can help your friends keep their bathroom just that much cleaner. The problem with many RV toilets is that the flushing isn’t always powerful and it doesn’t reach the entire bowl. That’s not the case with the Bravura. It offers full-bowl coverage during the flush, so the toilet can be cleaned properly each time. No one likes to think about the messy details when it comes to camping, but you can do your friends a great favor by offering this. You can’t always control the weather. If it’s raining outside, and you’re stuck inside of your RV or tent, it may feel like a bummer. One way you can help turn those camping blues around is with an electric fireplace. The sizes vary, though campers are likely to opt for the smaller size, so any kind of camper can easily fit one inside of their tent or RV. Just plug the fireplace in, and you can enjoy the heat and a safe roaring fire. Sometimes the sofas or beds provided in the RV just don’t cut it. They’re either too small, take up too much space, or just aren’t comfortable. If your camping friends have complained about the state of their sleeping arrangements, you can offer them a Jack-Knife Sofa to satisfy their needs. This unique bed doubles as a comfortable sofa, so they can make use of it in two different ways. The padding is high-density foam fit to follow te curve of your body. The bed also has steel springs, so you can actually feel supported when you sleep. When space is in question, or your friends are just not comfortable with their bed, you can come to their rescue with this camping gift. Actually any portable game will do. This is just one idea of many… if buying camping gifts for kids, look for some fun games. Let’s be honest, a lot of the best gift ideas for campers should always revolve around games. While camping itself is a lot of fun, there’s a lot of time spent sitting around while you travel to your desired destination. If you happen to travel in areas that don’t receive the greatest cell reception, you’re going to be stuck looking for old methods of entertaining yourself. You can help a camper out by equipping them with an old classic board game that has been shared and enjoyed by families for decades. The license plate game is simple, educational, and a lot of fun for younger kids. They’ll be able to not only learn what the license plates of other states look like, but they’ll also learn the geography of the country. A fine gift for those amusement and education. This made our list of gifts for campers because my sister-in-law gave this to our kids for our camping trip this past summer. Our boys loved. An extremely cheap but exciting gift is this fire colorant pack. While all campers love to gather around the fire at their lot and either cook on it or just enjoy its warmth, you can take their experience to a whole different level by giving them the ability to change the fire’s color. Kids and adults alike can find glee when their usual orange fire suddenly starts turning blue or red or green. It’s environmentally friendly and doesn’t emit any odors, so you can be sure you’re giving them a safe and pleasant gift. 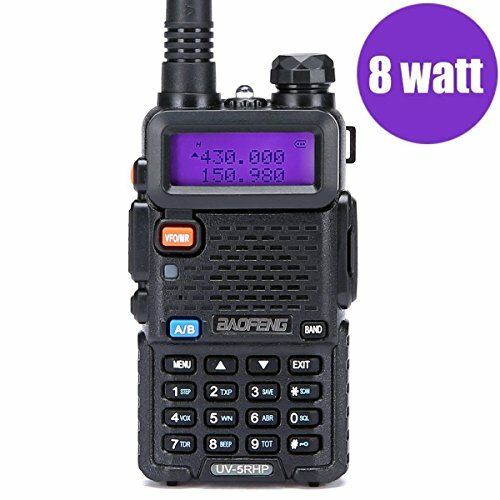 If you’re kids don’t have phones, they’ll love having walkie talkies. Our kids received a set as a gift and it was an instant hit.